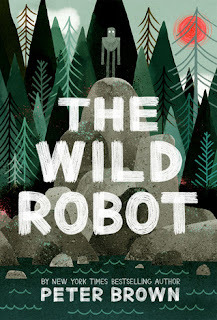 I stumbled across The Wild Robot when I was looking for audiobooks for my kids to listen to in the car. I wanted to find something fun and engaging, because someone speaking seems to hold their attention longer than someone singing. They absolutely loved this book, and so did I. I was able to relate to Roz throughout the story, and my son would frequently ask very thought-provoking questions. Roz felt out of place in her new home, but she accepted her surroundings and chose to survive. It was technically what she was programmed to do, but I think she took interest in things other robots would have ignored. She learned how to camouflage herself after an unfortunate encounter, and I believe that's when she started acting a little less robotic. It took me a few chapters to get into the rhythm of the story, because Roz does a lot of sitting around at the beginning, and she has to learn a lot of basic information we already know. The audiobook also includes a lot of sound effects at the start, which really distracted me from the story. My son enjoyed hearing the waves crashing in the background, and it made the story feel somewhat realistic, but I was glad when it stopped. When Roz adopted an orphaned gosling, my heart splintered into tiny pieces. She's a robot, so she doesn't technically have feelings or emotions, but she chooses to pretend for the sake of her new baby. She spent a lot of weeks watching the animals to learn their survival skills, and to understand how they communicate with one another. Eventually, Roz is able to have conversations will all of the animals on the island, and I thought those were fascinating perspectives to portray. I disliked the animal deaths, especially the ones that were her fault (unintentionally), but Roz acknowledges that death is also a part of life. Some animals die so that others can live, and it maintains a balance on the island. It was still hard to listen to, especially when Roz gives an unemotional account of their deaths. The narrator for this was fantastic! She does so many voices, and I never had trouble discerning who was speaking. Every animal had a unique voice, and I liked how much effort she (combined with the author's writing) put into giving them different personalities and expressions. The Wild Robot was about acceptance, understanding, and relationships. Brightbill didn't care that his mother was a robot, because he knew she loved him in every way that she could. Roz also cared deeply for her son and worried about his safety, despite a robot's inability to feel. Roz is also willing to help the animals of the island, even after they call her a monster and outright attack her. She never responds with violence or gets angry, but patiently waits for an opportunity to be helpful. My children really enjoyed listening to this in the car. It gave us something to talk about once we were home, and it made them pay attention and think while we were driving somewhere. The audiobook itself was only around four hours, but it took us a little under a week to get through it. We're not in the car that often, and never for long periods of time. Plus, I had to pause it whenever someone asked a question. Sounds very unique. I like that it’s pretty deep and got your kids thinking and asking questions. It was unlike anything else I've read, so that was nice. I also liked that it was geared for children, but raised points even adults should consider and have an opinion on. Climate change has impacted how much of the island is above water. They spoke of how the island became an island. There were conversations about survival and the way the world works -- even the brutal parts. Awe, she pretended. I like her already! She was able to look up relevant information, and she asked the other animals for advice. Roz even altered her voice to sound enthusiastic or excited to match the mood around her. She wanted to take care of the gosling, and I think she did a wonderful job. When he was learning how to fly (something she can't do), she analyzed the flying patterns of multiple birds and explained their methods to him. He was soon the best flyer of the group, and he applied strategies other birds wouldn't have instinctually known about. It was a lovely story! Oh I didn't realize that there were ebooks for younger, it's nice that! A talented narrator can make a good story even more wonderful. Glad to hear you enjoyed this one, Lindsi. Yes, I agree! 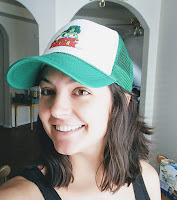 Sometimes a narrator improves a story, and other times they make it hard to follow. I haven't had much experience with the latter, so that's always good! I really like the sounds of this one. I like that she pretended to have feelings and was able to have conversations with the animals. I liked that she wasn't immediately able to understand them, too. It took her observing their mannerisms, body language, and sounds. They don't just communicate with their words/noises, but it's a lot more complicated with that. I thought the author did a wonderful job incorporating that into the story. It was wonderful! The author raises a lot of good questions about the world, and I enjoyed how he tackled those issues through various animal perspectives (and one robot). I hope you have a chance to read it soon! Let me know what you think! I love the cover, and this seems like a really cute story! I'm glad to hear that you and kids all enjoyed it so much!